Blistering sunshine, great visibility and a stiff, consistent breeze - sadly none of this featured on the final day of racing at the RORC Easter Challenge. As a slow moving front passed overhead, the Solent received a relentless deluge with the visibility dropping off enough to make it hard to see the weather mark. Conditions then deteriorated further with the deluge becoming a torrent, many crews turning on their yachts' navigation lights, despite it being lunchtime. 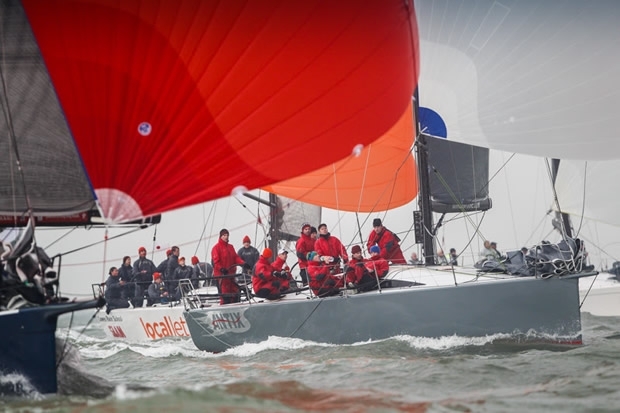 Nonetheless, the wind held during the day allowing PRO Stuart Childerley and the RORC race management team to lay on four races in the central/eastern Solent. In IRC One, Anthony O'Leary's Irish team on the Ker 39 Antix was the class act posting a 1-2-1-1, to finish 9.5 points ahead of James Gair's Cowes Race School crew on Zero II, the only boat to claim a point off the Irish former Brewin Dolphin Commodores' Cup winners today. "We have got good upwind speed in our fleet," observed Antix tactician David Lenz. "In IRC One there is a big mixture of boats - some like Tokoloshe get up and go downwind. Some days will suit them and some days won't." Lenz said that Antix's crew had benefitted this weekend from the coaching laid on by Jim Saltonstall, his colleagues and, from across the pond, the North U Regatta Services team of Andreas Josenhans and Chuck Allen. "They helped us with our starts and we are able to hold a lane for a good few minutes, even though it is hard against the faster boats. But we had good speed - high and fast, so we were able to mix it with the big boats." Finishing in sixth place in IRC One was Ed Broadway's black Ker 40 Hooligan VII. "We did better today because we like a bit more wind," said Broadway. "Apart from the weather it was very exciting racing - particularly the last race where Baraka and us finished within a boat length of one another, under kite - a final high"
This is the Hooligan team's second season in their boat, and the crew is currently gunning to get selected for the British team in this summer's Brewin Dolphin Commodore's Cup. Also scoring three bullets today was Peter Morton's new Salvo, the JND35, raced previously as the French-owned Gaia of Bernard Moureau. However this performance in IRC Two was not enough to topple Simon Henning's Mumm 36 Alice. "It wasn't the most pleasant conditions, but at least there was breeze and they did really well to get four races in," said Mike Henning, the Alice owner's son, who was racing on board. While Alice has been in the Henning family since 1996, over the winter she has been modified with a new rig featuring swept-back spreaders and increased sail, that has also shed its runners and overlapping jib. This is the first major IRC regatta the boat has done since these modifications. "We had some discussions with Mark Mills, who was involved in the mods," continued Mike. "We have got more optimisations that can be done, but we are quite pleased with it so far." A third boat to score three bullets in today's four rainy races was David Franks' former IRC Nationals winning JPK 10.10 Strait Dealer, that ended up claiming IRC Three ahead of Benoit D'Halluin's A-35 Dunkerque Plaisance - Gill Racing Team. This was the Strait Dealer crew's first 2014 outing on their boat and Franks said that the RORC Easter Challenge had provided a good warm-up: "We started a bit slow, but we got faster. The Easter Challenge is a lovely warm-up for the season and it has a nice feel to it. This year it was rainy, but we had the wind and the Race Committee did a good job with some pretty big shifts to deal with." After being the dominant force of the first two days of the RORC Easter Challenge, Louise Morton's crew on their Quarter Tonner Espada, had an off-day while Ian Braham's Parkstone Yacht Club team on their 22 year old MG 346 Haven Knox Johnston Enigma, was yet boat another to score three wins in four races today, causing them to close to within 1.5 points of Espada. "We had a great day - there was a little bit more wind, which suits us," said Braham (as his crew chorused "if only there'd been one more race!"). "We struggled a bit on the first two days with the Quarter Tonners that are really quick in the light stuff. We are a bit heavier and today that allowed us to stretch our legs and get going a bit." Braham said that this was the first RORC Easter Challenge they have sailed in about six years and he and his crew enjoyed the training being laid on. "We went to the post-race briefings and there was some interesting things that we learned particularly about starting which we were applying today and yesterday." RORC CEO Eddie Warden Owen, who was also part of the coaching team for the Easter Challenge, felt the regatta had gone well, even though today's soggy conditions were frankly miserable. "The wind was challenging for the new race officer Stuart Childerley and his team. But they did a very good job and I think everyone has had a great time. "This is a regatta where there's training with racing and we fully appreciate North Sails for their support in bringing two very good technical guys from America to help with the setting up of the boats. Everyone has appreciated that and I think the general standard has risen. I really believe that this Easter weekend should be much bigger."